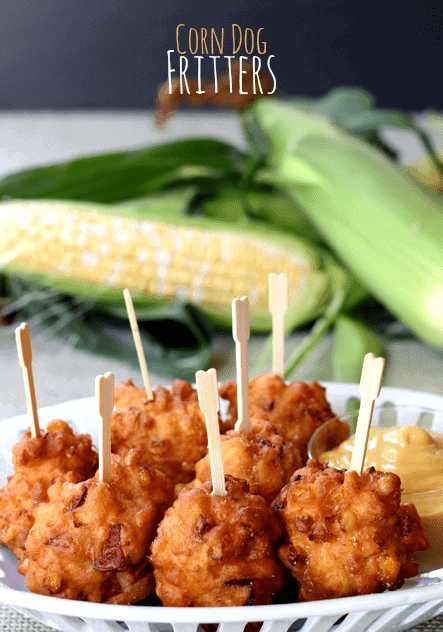 These Corn Dog Fritters are an awesome summer time, or anytime of the year snack! Instead of eating the whole corn dog you can have a smaller bite sized version! 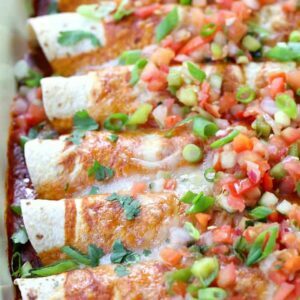 You can use fresh corn in the summer or frozen corn when you don’t have fresh available, either way these are great for an appetizer, snacking or even dinner. I came up with this idea after we had gone out for dinner and my little guy ordered a corn dog. He ate a couple of bites and then the whole hot dog came out of the corn dog shell. Then he just ended up eating the hot dog and leaving the corn dog part behind. 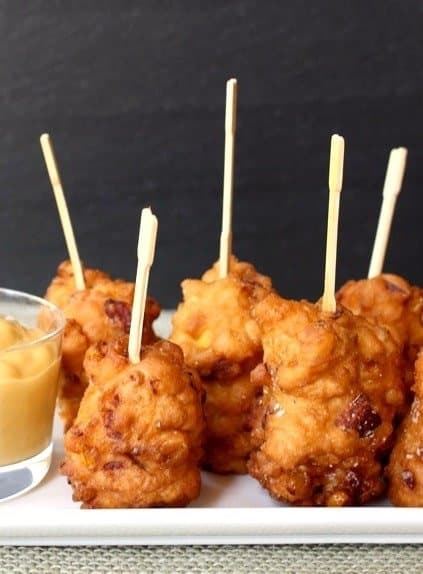 Not really a huge problem in the world of food, I know, but I thought if you made a corn dog into a fritter…smaller pieces and bite sized, that might solve the problem. Basically these are corn fritters with hot dog mixed in. I followed a simple corn fritter recipe and just made a few changes and they turned out pretty tasty. All you need to do is cut the corn kernels off a couple of ears of corn and set that aside while you make the batter. 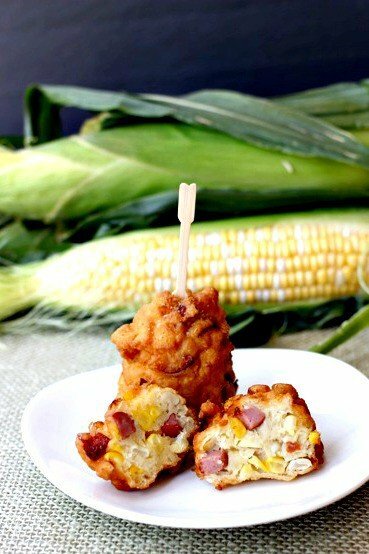 Simple fritter batter, flour baking soda, milk, butter and an egg – mix that all together and add the corn and the chopped up hot dogs. Drop by big tablespoons into your hot oil and fry a few minutes until they’re golden brown. Just cut one open before you take out a batch from the oil to make sure they are getting cooked through in the center. Season with kosher salt as soon as they come out of the oil and set on a plate lined with paper towels to drain. 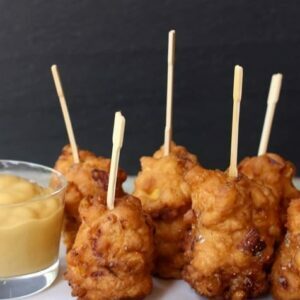 You could serve these Corn Dog Fritters with the standard ketchup or mustard – or we used honey mustard. But they’re fine all on their own too. Heat your vegetable or canola oil in a deep sided pot, filled half way up to 375 degrees. In a separate bowl combine the milk, melted butter and beaten egg. 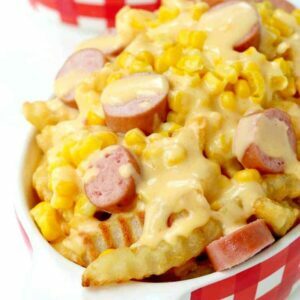 Stir the milk mixture into the flour mixture and then add the corn kernels and the hot dogs. Drop by large tablespoons into the hot oil and fry for 2-3 minutes, turning, until golden brown and cooked through in the center. Drain onto paper towels and season with salt. Serve with ketchup or mustard for dipping. Since hot dogs come in different sizes, we used a regular Oscar Meyer hot dog for this recipe. 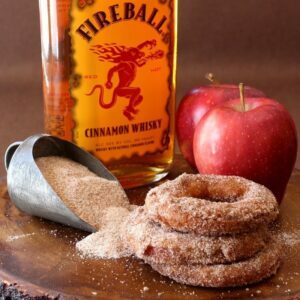 I would be my boys’ hero if I made these for them. Absolutely awesome idea! Thanks Matt! My boys love anything they can pop in their mouth and run away with. I have read the recipe several times and do not see anything about hotdogs. You’re right Ray, they get added in to the batter with the corn. I just updated the recipe card. Thanks for pointing it out! Thanks for letting me know Diane! Glad you all enjoyed them!